So I was one of the crazy people who got up at 3AM to watch the Sony conference live because, hey, E3 is gamer Christmas is it not? So I just want to give some quick impressions of what stood out for me personally during Sony’s conference, and please let us know what you liked and disliked in the comments below. Sony had a pretty bangin’ conference overall, leaving me feeling pretty impressed that they could steal some of Microsoft’s thunder after a really decent showing of their own. So I’m not going to go through everything but rather just give a few thoughts here and there, so let’s get to it. 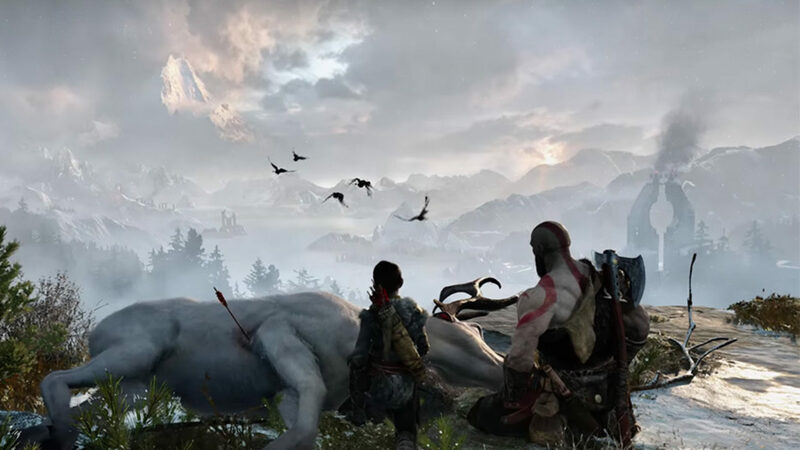 I think the new God of War reveal was quite a surprise, but for me personally it wasn’t as big a surprise as seeing just how okay everyone was with the new look and feel of the game and its combat, considering that it has essentially changed genres. This lack of issue may very well be due to the fact that the game looks really interesting and as most pointed out, it has a bit of The Last of Us’ vibe going for it. Horizon was shown off again, and strangely carried a lot of the same tone as God of War now didn’t it? Apparently you should buy into PlayStation if you are really keen on playing games that involve grizzled or rural types walking around trees with a yellowish colour tone to the visuals. I should be quite excited for Horizon: Zero Dawn as it checks all the boxes, but I’m finding myself strangely indifferent to it. I like the look of the hero, I like the world and the visuals but maybe it’s my difficulty grasping why the cool looking robot animals exist or function in the first place or that the gameplay seems oddly and overly familiar for some reason. If you want yet another Sony game that involves a grizzled character walking around near the woods with yellow visuals, then we also got to check out Days Gone, which looks to be somewhat of a cross between Walking Dead, World War Z and… well and a lot of other zombie material. It does look pretty though and seems to have a good sense of weight to the characters and gameplay, so I’m optimistic, but not entirely sold just yet. The vibe on some of these is so familiar that I’m convinced that Kratos’ son could be the brother of Aloy from Horizon, and Kratos himself could just as well pop that epic beard into leather jacket and join the biker gang in Days Gone. But let’s not kid ourselves though, these games all look pretty stunning. We finally have a date for The Last Guardian and people lost their pips, I just sincerely hope that after all this time the game isn’t going to feel dated in any way and can live up to the very, very high expectations that have been placed on it. I think it can deliver, but there’s actually a small but fair amount of potential for the opposite. Insomniac Games who are the guys behind Sunset Overdrive and Ratchet & Clank are working on an exclusive Spider-man title though did you know? It actually looks like quite a bit of fun, but again we haven’t seen much, so who knows. The VR stuff was up and down, with things like the Resident Evil VII reveal looking incredible, while also completely blindsiding us, but then on the other hand we were seeing way too many “missions” and “experiences” for VR, and I think we need to be past the point of tech demos and be going fully into entirely playable games before we brag about “50 games” that will be available for Playstation VR. Either way, price is still a bit much to ask above the price of a console, but it does look like it might be a lot of fun. Hideo Kojima showed off his new game. WTF naked Norman Reedus mom, WTF. Moving on. The little bit we saw of Detroit: Become Human from Quantic Dreams has me sold. I was a massive fan of Heavy Rain but didn’t care much for Beyond: Two Souls and this seems to scratch all the right itches and take us into something that’s not only cinematic, but deeply involved and filled with alternate paths and fine details. I can’t wait to see more of this and I really hope it’s good. I thought we’d see a teeny teaser for The Last of Us 2 but that didn’t happen, and that’s understandable enough but would have been in line with previous actions by Naughty Dog, we also didn’t see anything new and solid about the new Gran Turismo either. One of the biggest concerns really is just that so many of the things we saw that were worth getting excited for are miles off. If you look at the info that’s been given on actual release dates, there’s so little that you can get excited about now. God of War, Days Gone, Detroit, Kojima’s Death Stranding… we will only be playing most of these at the end of next year at best. It still did a great job of building up excitement though, with the entire show not really messing about and sticking to what’s important, but we mustn’t forget how many of these are nothing more than fairly distant promises. If I can ignore that niggle for a second then I’m happy enough to say that Sony really knocked it out of the park and it feels really good to know that there’s some really special stuff coming our way on the PS4.